I recently received a few questions from a parent of a little boy who has childhood apraxia of speech (CAS). This wonderful mom was feeling a bit nervous about her son starting kindergarten, as many parents are. It can be bittersweet for any parent who is readying their child to begin school, but if you're a parent of a child with a communication disorder, you have even more to think about. 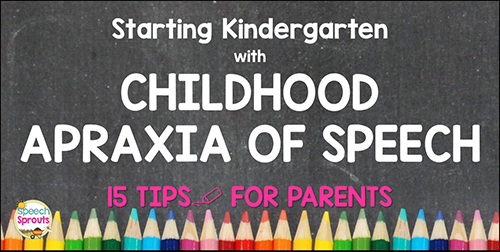 In this post, I'm going to talk to the parents of prospective kindergartners who have been diagnosed with childhood apraxia of speech or other communication disorders. Mom wondered what questions she should ask about in regards to setting up services for her child, how to navigate and advocate in the school environment, and what she should share with teachers and students. Ah, I understand how it is to be nervous for your child! Butterflies about the unknown ahead. Is this you too? If your child has CAS or another type of communication disorder, you may worry and wonder if you are doing everything you can to help your child be ready for their big new adventure. It'll be ok. Let yourself feel the excitement for your child as well as the butterflies. You've already taken the steps to have your child assessed and start speech therapy before school. First of all, kudos to you mom or dad! I wholeheartedly believe in the power of early intervention, and you were able to begin addressing your child's communication needs early. You are amazing. Sadly, I see so many children start preschool or kindergarten with severe communication disorders that have never before been assessed or received treatment. There are many reasons that may happen, so if you know a parent who has concerns about their child's development, please, please let them know there are services available for children who are not yet school-aged. Many services are free or low cost. Have them talk with their pediatrician, or call their school district. So now it's time to prepare for kindergarten. You wonder, what do I need to know? Do? Every child's needs are different as they start school. I can’t make specific recommendations as I haven't assessed your child. If you have specific questions about your child, please consult with your child's SLP. 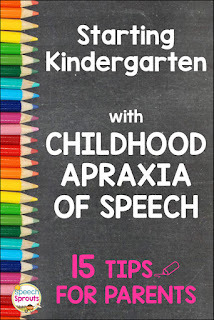 What I can do is give some general tips for parents of children with childhood apraxia of speech or other communication disorders as they prepare for their children to begin school. These recommendations are not meant as medical or educational advice and are informational only. Here are a few steps you may take to help make a smooth transition to school-based speech therapy services if your child qualifies. (Or to add school-based therapy if you are continuing private services). Call your school and ask to speak to the department that handles speech therapy referrals. The name of the department varies by area and may be called the special education department, pupil services, exceptional students program or something similar. Call and explain that your child is diagnosed with an articulation disorder and you would like to set up school services for him or her. Tell them if you have a specific diagnosis such as Childhood Apraxia of Speech. Obtain records of your child’s most recent assessment and therapy notes from your current speech-language pathologist. Give a copy to the school. Ask what documents you need to provide. You may need to get a current hearing and vision check or a script from your child’s doctor. Talk to your current speech-language pathologist (SLP). Ask if there are any specific recommendations for your child. Have her write them out so your school SLP can review them. Be aware that the criteria for eligibility for services differ in medical settings and school settings. In schools, eligibility and services are based on educational need. Ask questions about the criteria used if you don't understand. The school may want to do a new assessment, to update the picture of your child’s current skill level and help determine eligibility in the schools. Some schools may look at a previous assessment and accept it if current. Others are required to do their own assessment. It depends on the rules in your state and locale. Contact the school speech-language pathologist if you have questions. Be honest and open. The SLPs I know truly care about their students and are ready and willing to talk to parents and help guide them through the process. They want to partner with you! If your child has CAS, ask about the SLP’s experience and training in Childhood Apraxia of Speech. CAS is relatively rare, and many therapists haven’t had the opportunity to gain expertise in this area. This is true both in schools and medical settings. If your SLP has little experience or a limited comfort level in diagnosing and treating CAS, ask if they would be willing to go for additional training. If there is another SLP with more experience in your district who can help, that can be an option too. In my state, you can request additional training at the IEP meeting. Procedures may vary where you are. You will be invited to a meeting held to review any assessments, determine eligibility for services and discuss your child's educational needs. Parents are an integral part of this process! You should receive a copy of any new assessments before the meeting, and a copy of recommendations for goals if the district is proposing any. Read these, and ask any questions you have. If acronyms or terms are used in the discussion that you are not familiar with, ask! The team wants you to understand. If your child is eligible for speech therapy services, you can ask for practice work to be sent home. This is especially important for children with CAS. If you can, meet with your SLP to learn how she is prompting and instructing your child so you can follow through at home with the same methods. This way you can help provide frequent, specific practice which is so helpful. I think a terrific resource for explaining Childhood Apraxia of Speech is Dr. Edythe Strand’s Videos on YouTube. You may want to share the links with teachers and staff. You can find Dr. Strand's videos here: Childhood Apraxia of Speech, information for Parents. The Apraxia Kids website has many handouts and brochures for parents, including an easy to read explanation of childhood apraxia of speech and letters you can share with your child's teachers. Find Apraxia Kids resources here. If your child his not able to make himself understood to express basic needs like "I need to use the bathroom, I need a drink, or I’m feeling sick" talk to the school SLP about setting up a system with his or her teacher to express basic needs on day one. As your new SLP gets to know your child, she'll be able to determine what kind of support (if any!) your child may need in the classroom, lunchroom, gym etc, and can work with his or her teachers. I find most kindergarten students are very sweet and accepting of each other's differences. Many want to help, sometimes too much! For instance, if the other children tend to talk for your child, and not give him a chance to try, you can ask the teacher to be sure the rule is no interrupting each other and everyone gets lots of time to talk! SLP's, if you would like more information about CAS, read my series on Childhood Apraxia of speech. 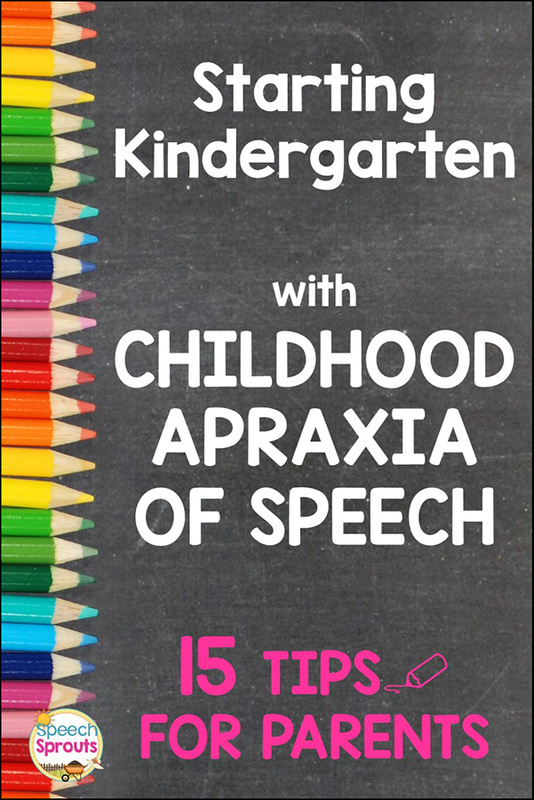 The first post is Childhood Apraxia of Speech: What SLPs Need to Know. I hope this helps as you prepare for your child to begin his or her new adventures at school. One more tip: Pin this image to your Pinterest boards to so you can easily find this post to refer to later. Congrats on reaching this milestone in your child's life. I bet kindergarten will be wonderful. Hugs!